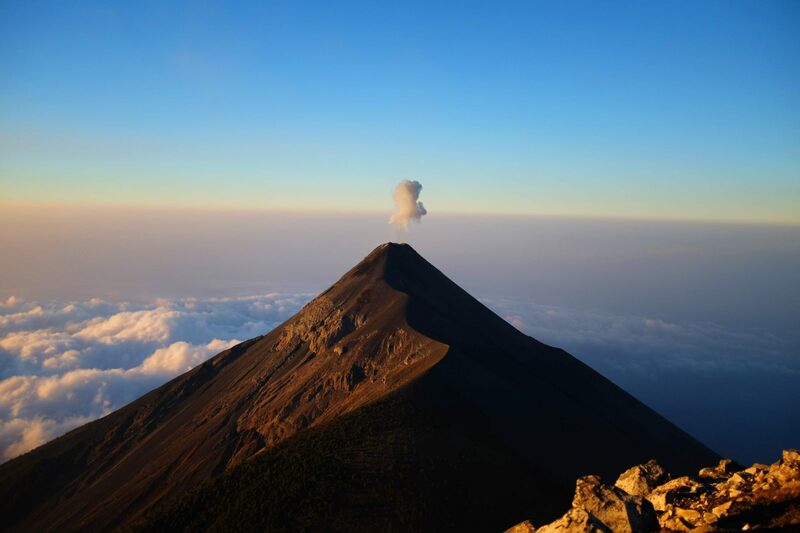 When in Antigua there is ONE thing you must not miss out, hiking the volcano Acatenango. Yes you need to be fit, yes it is hard but everyone makes it. It's all about the mental! Come on you can do it, Read below for all the information you must know before booking yourself a tour. Prices vary from QZ 150 to QZ 1,000. A decent price is between QZ 200 and QZ 300. 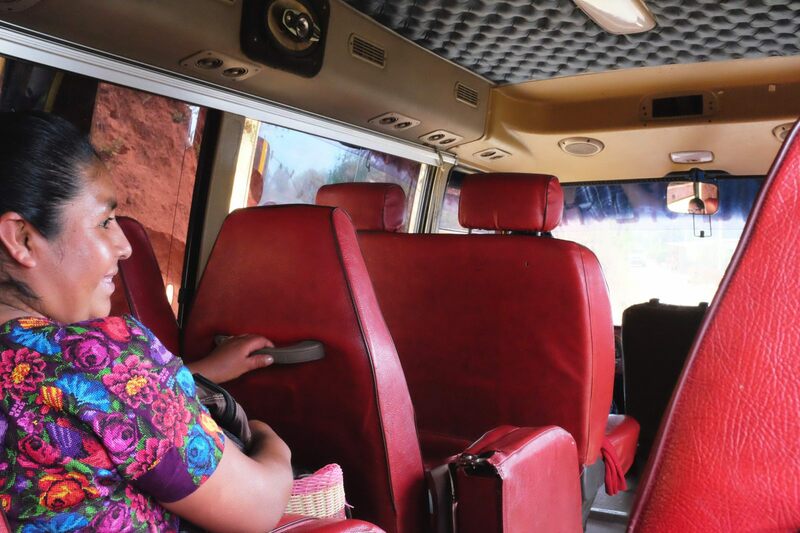 There will be 7 stops until basecamp the first day. The hike length varies between 4:30 to 6 hours depending on the group pace. Average time for a group of 30 is 5:30hrs. And the first arrived will be setting up the tents and the bonfire! Leaving at 11:30AM you will be at basecamp around 5pm. 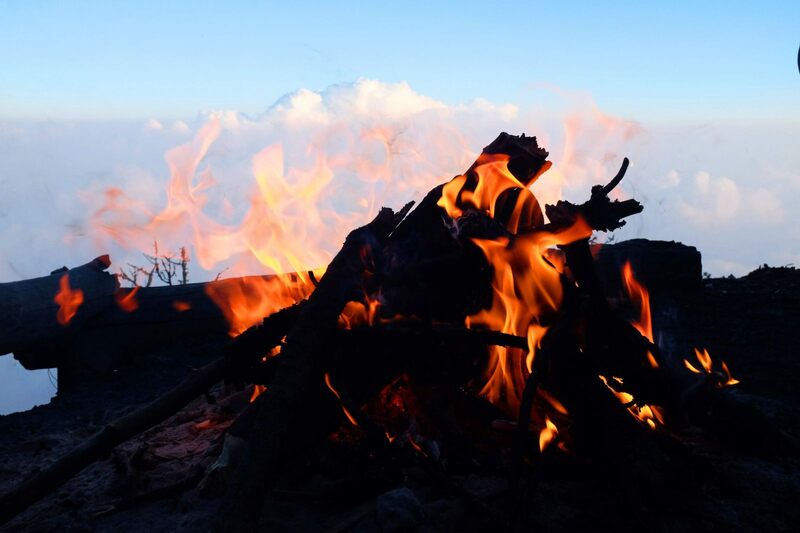 Our tip is to set up your tent near the fire to stay warm at night since the temperatures go down below zero. Depending on your group number you may be sharing the tent with 2,4 or 6 people. The tent is 3 seasons but you may want to pack very warm clothes for a better night sleep. Our advice would be bringing a inflatable pillow too! A little bit of comfort will not be too much here trust us! The bonfire will be on all night as the guides will be bringing lots of wood. It will help you stay warm and will also be used to heat the water for hot chocolate and instant noodle soup included in your pack. The guides will ask you to offer your own water, the more people give the less you have to give so being generous here is very important. You’re in the middle of nowhere above the clouds so humanity is key. Some people may not have packed enough food or did it it all too early. Act of kindness here is very welcome and the sense of community can be felt. Happiness and sharpness will be felt during your trip. Dinner will be around 7pm with the guides sharing maya stories and love songs. In the meantime the volcano Fuego right in front of you will keep exploding every 5 minutes making impressive noise, smoke and magna. If you’re lucky (and safe don’t worry) you may see couple of eruptions too! At very night, the stars will start showing up, the magna becoming redder and covering the entire volcano in golden sparkles. Shooting stars will appear here and then and right before dawn the moon will rise above Agua volcano. What a show! At 4am, the guides will wake you up. It is quite a tough wake up call since it will be cold, windy and you may be tired from the previous day. But cheer up, you are about to see the most spectacular thing ever! Don’t eat too much before the hike (some people have thrown up during that part of the hike due to altitude). 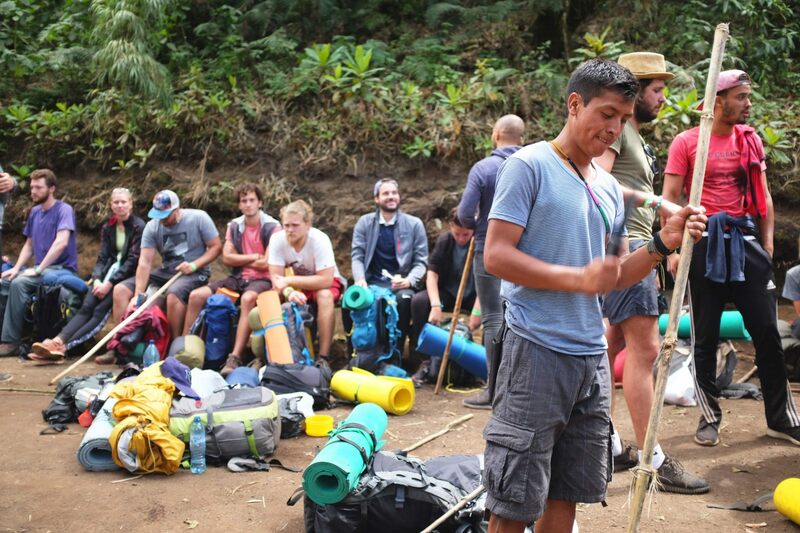 You will not need to bring your backpack (it will stay at basecamp) all you need is some water, your walking stick, camera / go pro / phone and your frontal flashlight. 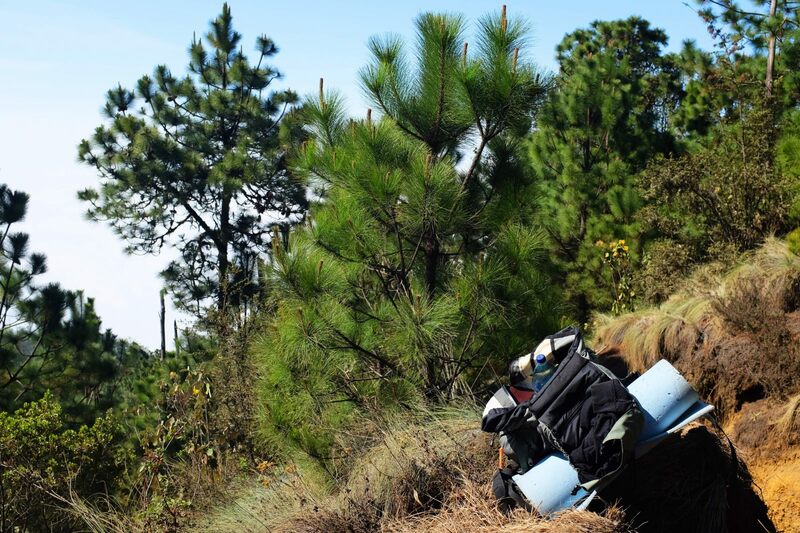 You will be walking for 1:30h to reach the top of Acatenango volcano. There won’t be many stops since you will have to be pretty quick to reach the top before sunrise. 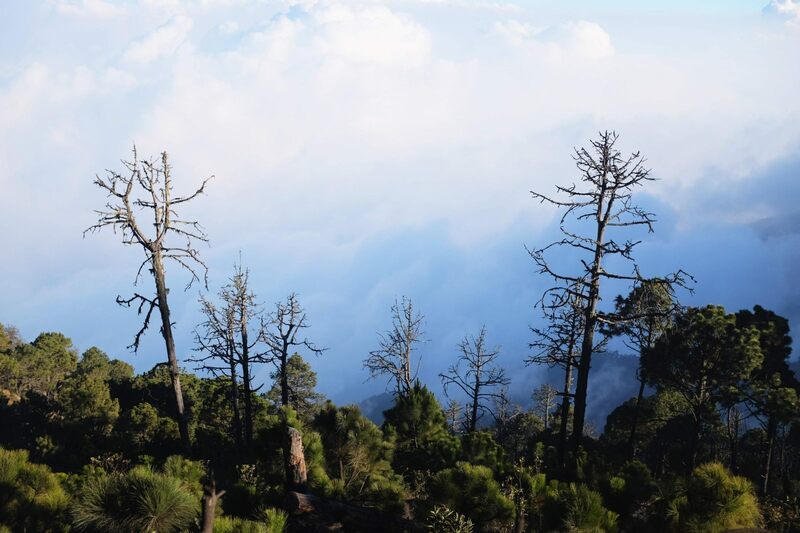 The hike will feel like the worst part of this trip, you will feel the altitude (almost 4,000 meters) and tiredness kicking in and you will not see much of the trail in the darkness however just keep going you’re almost there. Giving up now would be a shame. you’ve done 90%, there is another 10% very much worth it. This is it, you made it to the top, the guides will be very proud of you and will welcome you with a high five and a big smile. Now it is time to enjoy for about half an hour. 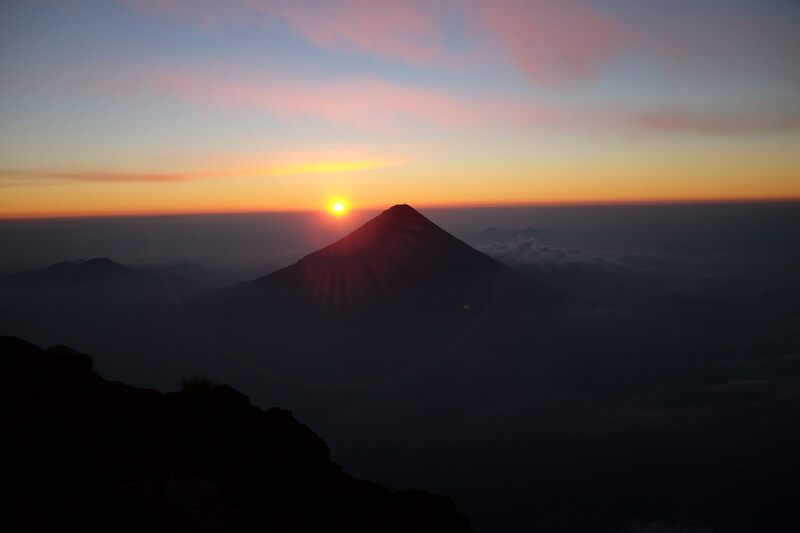 On your left you will see the sun rising behind volcano aqua, above the clouds. In front of you Volcano Fuego will explode and erupt smoke and magna amongst the clouds and a rainbow sky. 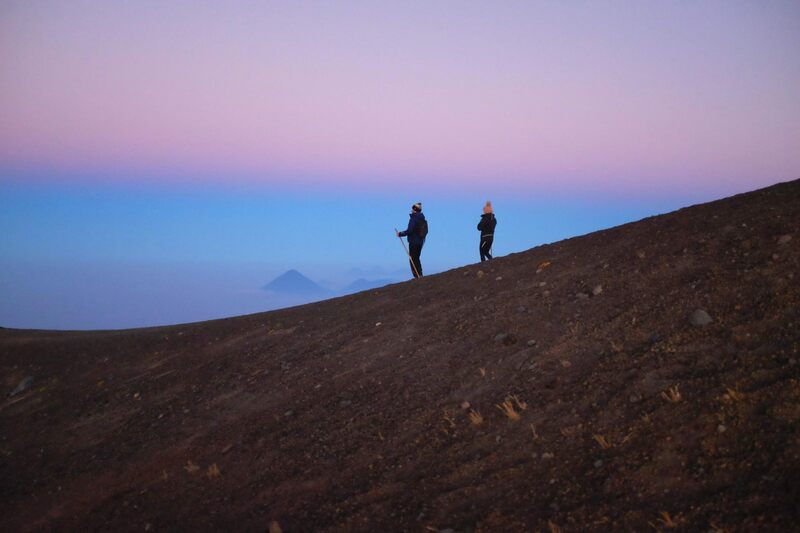 On your right the other mountains in the background with a changing colour sky from blue to pink showing shadows of hikers walking along the top of the volcano. 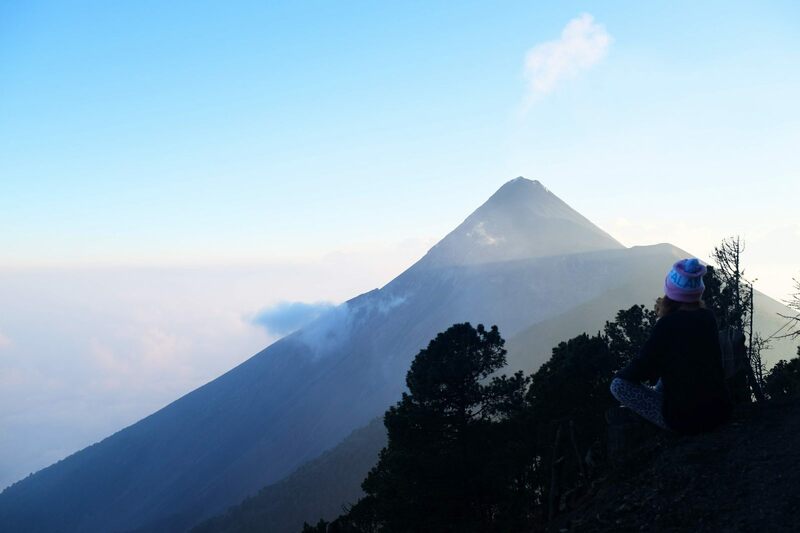 Say hello to a 360 view of 4 amazing volcanoes each of them having their own show. Time to enjoy, look around and take some memorable pictures. Around 6:30am you will be going down but great news this is going to be lots of fun! The ground is very much like sand dunes so all you have to do is run, slalom amongst the stones and go down like if you were skiing. You will reach basecamp in about 25 min. One there, time to get rid of all the dust you’ve gathered up there, quick breakfast and packing of your stuff. No time to rest you have another 2 to 3 hours going down. Leaving around 8:30am you will touch down the village around 11am. It is not an easy hike although better than going up, but it gets tiring and boring, but keep it up, and be careful with your knees, try to hold onto your stick when going down it helps. Well done! You did it all, you can be proud! You deserve a Modelo beer for 10QZ! At the village the locals will ask you for stuff you have rented from them, you will need to give back your sleeping equipment too. Then right away you will jump in the van to bring you down to Antigua within an hour. Most of you will be sleeping in the van and be woken up by the cobbles meaning you’ve arrived!